We are currently living in a ‘linear’ economy. This means that we extract resources to make products which are used and then usually thrown away. Resource use is in fact expected to double by 2050, and pollution and waste creation can be expected to rise as the global population increases and becomes more affluent. For example, by 2050 it is estimated that there will be more plastic than fish in our oceans. This begs the question as to how we can reshape the economy to overcome the challenges created by economic scarcity and the make-use-dispose culture? 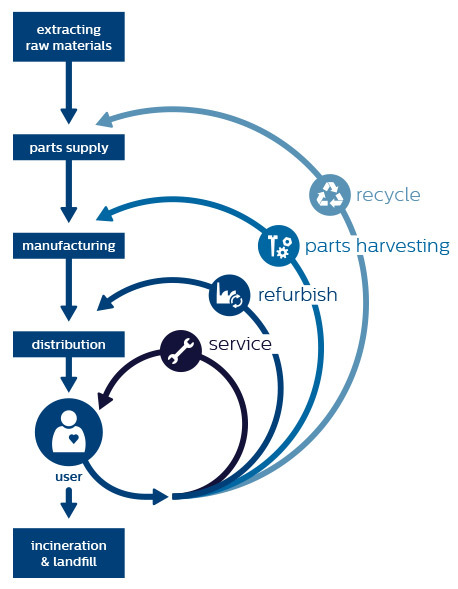 A circular economy seeks to minimize the initial resource requirements, keep resources in use for as long as possible, extract the maximum value from them whilst in use, then recover and regenerate products and materials at the end of each service life. Recycling and reuse is considered in the initial design of products and services in order to allow for the circulation of the material in the economy and to minimize waste creation. The transition to a circular economy does not merely aim to reduce negative externalities of the linear economy – it represents a system change to produce business and economic opportunities, build long-term resilience, and provide societal and environmental benefits. According to a study by the Ellen MacArthur Foundation, a circular economy is expected to create a net economic benefit of €1.8 trillion in Europe by 2030 – i.e. an average increase in household income of €3,000. Such a system would also halve carbon dioxide emissions compared to current levels. Sounds good? So how do we make it happen? To really drive such a change, a circular economy would need to be promoted throughout the system. You can create the most efficient, 100% recyclable product or material, but if no-one adopts it, it is of little use. There is a growing recognition amongst policy makers of the circular economy’s potential to invigorate an economy through cutting production costs, negative external costs to society and increasing profit margins of firms adopting it. For example, in 2009, China enacted the ‘Circular Economy Promotion Law’. Amongst other things, the law sets out incentives to industries and activities that promote the conservation of energy, water and materials – and provides legal liability, punishing those that produce or sell prohibited equipment or products. Finland has created and started to implement the world's first circular economy roadmap, aiming to become a global leader in the circular economy by 2025. Moreover, earlier this year, the European Commission announced the implementation of the Circular Economy Action Plan which includes an EU strategy for plastics in the circular economy. Businesses are beginning to think about how their products are made, packaged and shared. ‘Just Water’ sell their product in water bottle that is 82% plant derived, with the cap and shoulder made from sugarcane. The company partnered with the city of Glens Falls to bottle the excess water that the city wouldn’t otherwise need. Furthermore, ‘Wefood’ in Denmark sells goods that supermarkets, suppliers, wholesalers and producers are not interested in due to them being either manufactured in excess, close to expiry or faulty packaging. The goods are sold 30-50% cheaper and the company's profits go the world’s poorest. As consumers, we also have to play our part. What can you do? 1. You’ve heard it before: bring your own bags to the supermarket; buy your own trendy, re-usable coffee cup; avoid single-use plastics and packaging. These small steps do have an impact on the waste that you are creating in your everyday life. 2. Recycle and dispose your waste correctly. If you are unaware of how you are supposed to recycle your household waste it is very likely that you are putting things in the wrong bin so that your waste ends up in landfill and is not recycled and reused at all. Check your local recycling policy to be sure that your waste can be used most effectively. 3. Support businesses that are making an extra effort to reduce their waste and environmental footprint if you can. 4. Change can also be driven from within. Have you thought about how your workplace and company is doing in terms of sustainability? Where could waste creation and pollution be reduced? Shift to biodegradable, renewable, and recyclable materials wherever possible. Overall, the linear economy as we know it is rife with inefficiency. At the rate we are consuming our environment is destined for further degradation. Luckily, the circular economy offers our clearest alternative and will bring several benefits to business and society. This is a cause for optimism, and we have the opportunity to act together to reshape the economy. International Resource Panel of the UN Environment Programme (2017). Assessing Global Resource Use; A systems approach to resource efficiency and pollution reduction.